This is a photograph of the Cowan Drum Corps taken in Saint Paul, Kansas. 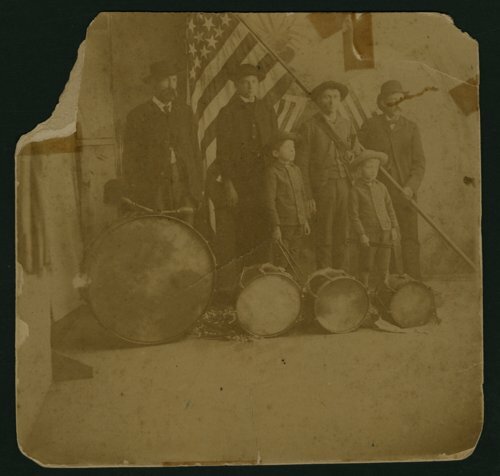 Henry Cowan organized the drum corps which entertained at Old Settler's picnics, G.A.R. reunions, and special gatherings. Members of the band are: back row (left to right) Edwin Henry Harrison Cowan, George Cowan, Willie Wowan, Frank Johnson and front row Harry Cowan and Charlie Cowan. The flag in the photograph was made by Mrs. McAlister and other young women in the community. John Mason , a farmer and Civil War veteran, painted the stars and made the staff. It was used on many patriotic occasions, and later the flag fell into the custody of the Cowan family.